The Pasta Man is a young lawyer from Washington, DC. He cooks a lot of pasta and other things, too. He blogs at www.thepastamanblog.com. One of the many things I like about banana bread is the way it rewards procrastination. Oh, you left a bunch of bananas on the counter until they were overripe and started to attract fruit flies? Usually, this kind of situation would end badly for our hero: you snooze, you lose; the early bird gets the worm; etc. But not with banana bread. No, banana bread rewards our hero with a rich, delicious treat that can only be made once those bananas get a little gross. My typical banana bread is straight Mark Bittman (oh captain, my captain!) and contains a secret ingredient, coconut, which adds a richness and complexity of flavor that can’t be beat. That recipe’s great, but I’d gotten in my head the idea of making a healthier banana bread, and once I saw that Chris Kimball had a version, I knew that it would be good. This one has a secret ingredient, too: plain yogurt. Also, cake flour. Who knew? I also cut down the sugar to ½ cup from 3/4, just for personal flavor preference. The cake flour gives it a nice, light texture and it’s plenty moist without a lot of butter. 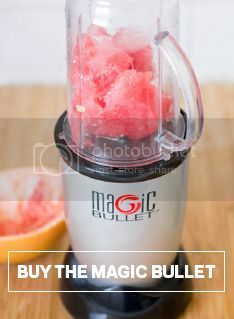 The Magic Bullet does a great job of creaming together the wet ingredients, taking the effort level from minimal to zero. Blend wet ingredients (bananas, yogurt, vanilla, butter, eggs) in Magic Bullet. Mix dry ingredients (flours, baking powder and soda, salt, sugar) in a bowl, then stir in the blended wet ingredients. Do not overmix. Grease loaf pan with spray and add mixed ingredients. Bake about 55 minutes, until knife comes out clean when inserted. Let cool for ten minutes and serve.